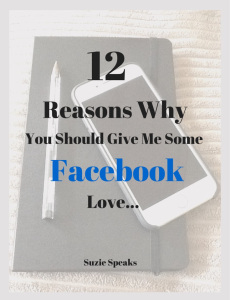 Next Saturday I’m going to be hosting a Facebook link party – here’s another 12 reasons why you should follow my Facebook page! It’s always quite embarrassing when trying to promote ourselves. As bloggers, lots (NOT ALL, but lots) of us want our ramblings to be read, shared, commented on, and as my views have increased I have had to resist shouting it from the rooftops when I have written a post that I am proud of. However, there is no point in being coy about this: this is blatant self promotion.